Ferry To Nova Scotia - Which One To Choose? Ferry To Nova Scotia – Which One To Choose? Ferry service linking the United States with Nova Scotia was in place for over 100 years until many factors contributed to it being discontinued a few years ago. It used to be that you could hop on cruises from Bar Harbor, Maine or Boston or Portland and make the trip over to Nova Scotia by boat. Talks are underway to re-start a ferry system that links these East coast cities with each other but until the ferry to Nova Scotia is restored, here are some other ways that you can access Nova Scotia. From Boston, Nova Scotia cruises consisted of a simple ferry ride and you can still access the province with a car if you drive up to Saint John, New Brunswick and take the short ferry ride over to Digby. This ferry route is still in operation, and although it may not be as convenient to Halifax as before, it gives you a nice option to travel by car exploring the states and provinces that you encounter along the way. With the ferry to Nova Scotia not up and running, you have the option of taking a bus if you’d rather not drive. The Greyhound Bus Company has regularly scheduled trips from New York to Halifax and Yarmouth, with stops in-between. Instead of a ferry from Maine to Nova Scotia, how about taking a plane? Several airlines service Halifax and go directly from Montreal, Toronto, and Portland as well as other hubs across the country. Trains run by VIA rail also have a service from Montreal to Halifax, which allows you to sit back and enjoy the views without the extra hassle of driving yourself. Of course, Sydney and Halifax are also visited by numerous cruise ships as part of their New England and Canada cruises itineraries. Seeing Nova Scotia this way is just part of the Maritimes and Eastern U.S. ports of call, so you can visit both Boston and Halifax, or Bar Harbor and Halifax on the same trip. 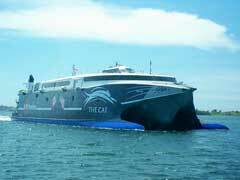 There are rumblings that a new and improved ferry system will get back into place within the next few years. Until the ferry to Nova Scotia has been reinstated, however, there are plenty of other options for you if you are looking to have a fabulous vacation in Nova Scotia. Halifax is a gem of a city with a rich history and a maritime past that shouldn’t be ignored. Whether you wait for the ferry to Nova Scotia or use another way to get there, Halifax will leave you with fond memories of the days on her shores.